While he's best known as a comedian, actor, director, producer and television host, Jon Stewart can now add goat herder to his resume after helping to rescue a pair of "baaaaad boys" from the New York Subway tracks. 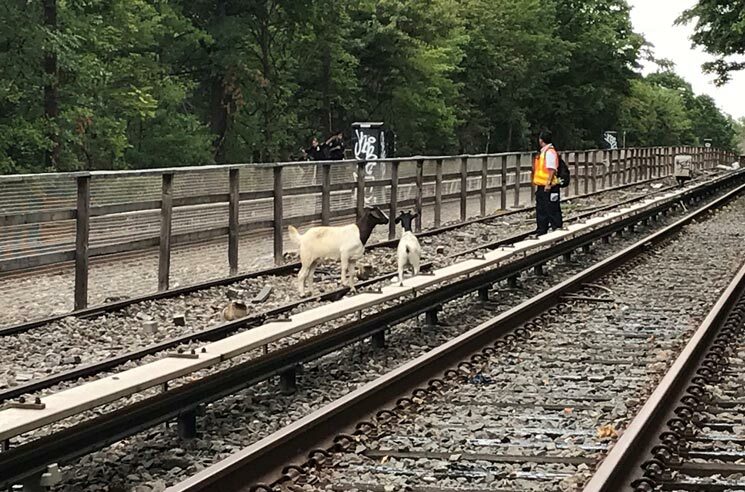 Yesterday (August 20), two goats disrupted train service in Brooklyn after being spotted roaming the tracks. It was unclear how the goats came to be on the tracks, though an MTA spokesperson told the BBC that the pair were simply "munching grass." As video shows, the pair of goats were captured with the help of Stewart and his wife Tracey, who are both supporters of the Farm Sanctuary shelter in Upstate New York where the goats were taken. Stewart and his wife also own a 12-acre farm in Middletown, NJ, where they provide sanctuary for abused animals. A new one for us (we think): Two goats are roaming along the N line tracks in Brooklyn. They're safe and not currently affecting service, but they are on the run. We'll keep you posted. The goats have been removed from the tracks by NYPD, and service is resuming. We thank ewe for your patience.